The king of the polymer pistol has a new celebrity spokesperson! Carlos Ray Norris. Better known as Chuck Norris. Maybe you’ve heard of him? 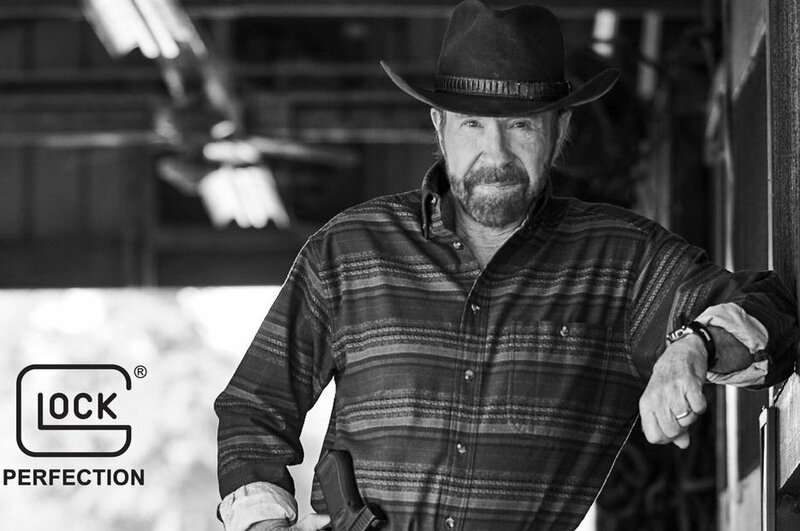 “Chuck Norris revolutionized and ushered martial arts into the American mainstream just like GLOCK revolutionized firearms by inventing and commercializing polymer-based pistols and the SAFE ACTION System” said Josh Dorsey, Vice President of GLOCK, Inc, in a statement obtained by GunsAmerica. SEE ALSO: Customs and Border Protection Awards Glock $85 Million Contract for Glock 19, 26 and 47! With the passing of R. Lee Ermey aka “Gunny” in April of 2018, Glock was no doubt looking for someone to fill the role of public ambassador for the brand. The problem is how do you replace a legend like Gunny? You don’t, I guess is the answer. Instead, you have to find someone who will proudly continue the legacy of what was started. And, I ask you, who better to carry that torch than Chuck Norris? Norris will be making his first public appearance as a Glock spokesperson during the 2019 NRA Annual Meetings & Exhibits in Indianapolis later this month, April 26-27, 2019. We’ll be there. Hopefully, we get a chance to meet this Hollywood icon. Dang nammit, and I recently sold my only Glock! Glock invented polymer pistols? I didn’t think Glock was even making guns in 1970. See: H&K VP70. I too, was going to dispute their claim to inventing the poly gun. Mainstreamed it, yes. Invented it, no. Since John Wayne is other wise occupied Chuck Norris is the most logical choice to take over the role. Personally speaking, I think Chuck Norris is much better suited than John Wayne to represent Glock. The fact that many of the young folks of America don’t even know who John Wayne was. Totally different generation of Americans. Congratulations to Glock and Chuck Norris. What a combination. Can’t wait to see if Glock will be creating some of those witty commercials that Gunny used to star in. I can see the advertising tag line now.